When you need to transport your products to other places, it is essential that you have a proper packing. This ensures that the goods are not damaged in transit. If the packing is faulty then you at the risk of suffering losses. One of the problems you face while packing the materials is that your tape may not stick. Why won’t your tape stick? Ensure that the surface is clean from dust or any oily substance. The surface needs to be washed properly. You could try using rubbing alcohol to clean the surface and then let it dry before you stick the tape – that usually helps. Also, check that your hands are clean when you apply the tape. The dirt on your hands can affect the adhesive. The adhesive tape is temperature dependent. If the room temperature is very cold, then it’s important that your tape has the proper adhesive to stick while in that environment. If the temperature on the surface of the packing material is cold you may also need a special adhesive. Rough surfaces will require a thicker adhesive. To check if the surface is rough, try sticking the tape on a flat surface like glass or metal. If the tape sticks, then you need to make the surface smooth or use a tape with a different adhesive. Additionally, regular adhesive tapes won’t stick to silicone, waxed or polyethylene surfaces. You’ll need to use a customized adhesive for surfaces like these. Use a specifically designed tape for recycled cardboards. The reason is recycled cardboards usually have small fibers on the surface which break. An ordinary adhesive tape won’t stick for too long on cardboards like these. The adhesive tape, if too old, can lose its adhesive properties. Therefore, make use of a fresh roll of tape if you’re having trouble sticking it to things. A freshly finished tape is naturally stronger than an older tape. Some tapes are pressure sensitive. In that case, you need to ensure that you apply proper pressure while sticking the tape. The pressure should be applied throughout the length and width of the tape in the correct manner. Different types of products need a different kind of packaging, so you need to make sure that you have the correct adhesive tape for that particular packaging. A customized tape is a good option instead of taking the risk of applying the wrong tape. 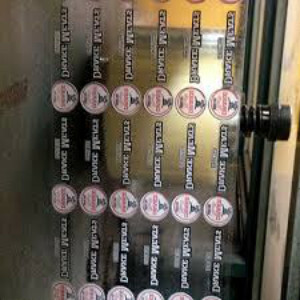 There are professionals out there who are well-versed to deal with adhesive issues on custom tape. If you want to talk to an experienced professional who knows about tape adhesives, get in touch with us at Jet Label.